Open enrollment for the international Master Class of Lyrical Singing and Stagecraft organized by Accademia Musicale della Versilia. Enrollment includes both disciplines, it is not possible to enroll only for one of the two. The Master Class is for any lyrical singer with no age limit, both italian and foreigner. The purpose of the course is to refine the singing technique and the intepretation of the classical singing repertoire, the focus will be mostly on the opera “La Boheme” by Giacomo Puccini. The participants can anyway present any programme. – Contract for the World Premiere Opera Lirica “Il Tesoro di Alarico” by Salvatore Frega libretto by Manuel Renga (12 shows comprising the first execution and the replays). – The best voices will be presented to the most important international theatres. Every participant will receive a certificate of attendance. The Master Class will last 4 days with lessons from approximately 10:00 am to 01:00 pm and from 02:30 pm to 6:00 pm. To every actual student will be guaranteed a daily lesson with both teachers and their assistant. The afternoon of the fourth day will be reserved to audition the auditors students. 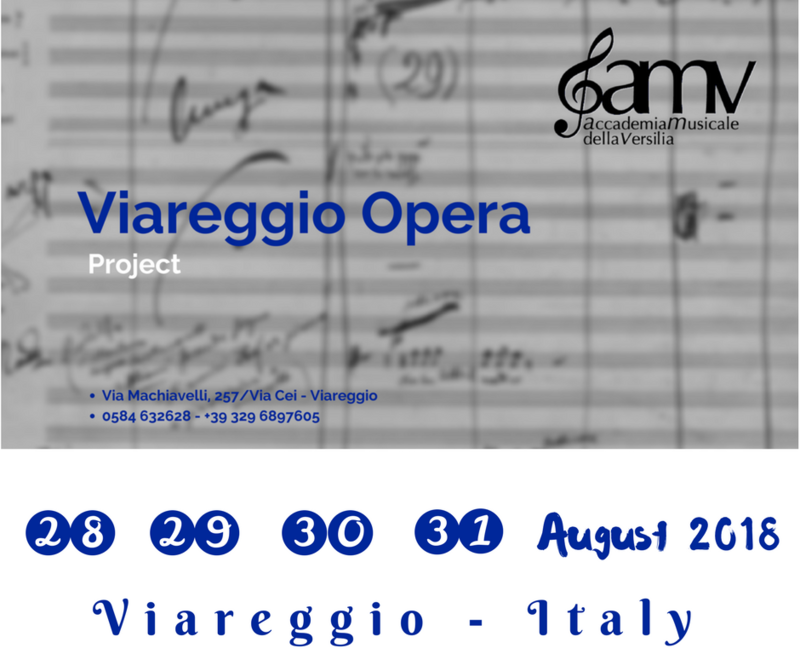 The Master Class will take place inside the Accademia Musicale Della Versilia, via Machiavelli 257/ Via Cei, days August 28th – 29th – 30th – 31st 2018. Opera Lirica: “La Bohème” by Giacomo Puccini. As been said on point 3, the programme can be different for the ones who would like to refine different areas of interests. The study materials (sheets music) must presented with three copies and delivered on the first day of course. The Master Class will accept only the first 20 real subscribers; all the other students will be possibily accepted as uditors students. The uditors students (till all the position are filled) will have the right to be heard/have lesson in the afternoon of the last day of the Master Class. 9. Subscription fee and entire course fee. The subscription fee is € 50,00. By subscribing the participant gives the permission to be filmed and transmitted on the radio, on television, on audio tape and video taken by the organizer itself or by staff members and authorized organizations. Particularly, the participant gives every right to the organization, free of charge, of video and audio recordings for any use related to the event. The organization reserves the rights of utilizing images, audio and video recordings for the promotion related to the present or future events, or to publish audio and video recordings for demonstrations and promotional intent. By subscribing the participant gives the authorization of his personal data treatment as stated by the italian law (Dlgs 196 del 30 Giugno 2003). 13. Validity of the call in italian language, responsability and acceptance. The present call is published in both italian and english language. In case of any inconsistency or discrepancy between the two versions, the italian language version shall prevail. The direction reserves the right to modify the present call. If some modification to this very call were to be made the direction will promptly let all the participant know. By participating to the Master Class the call is to be consider entirely accepted. Any dispute will be face by the jurisdiction of Prato.